Double-Decker Potato Taco Recipe - Here is your potato recipe, this recipe is about how to make double decker potato taco. 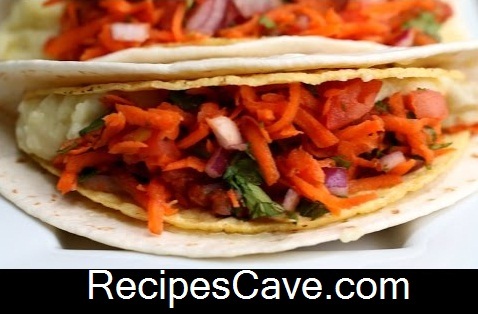 Follow these simple steps mentioned bellow to cook double decker potato taco. Cover the potatoes with cold water and simmer until tender, about 20–25 minutes. Warm the chopped garlic in the butter over low heat until softened but not browned, about 10 minutes. Add the cream and bring to a boil. Coarsely mash the potato mixture and fold in the warm garlic mixture while the potatoes are still warm. Season to taste with salt and white pepper. Keep warm. Make the double-decker taco shell: on a griddle over low heat, sprinkle a tortilla with about 2 tablespoons shredded pepper jack cheese. Once the cheese melts, place the fried corn taco shell on the cheesy tortilla and press the tortillas together to create the double decker taco. Mix the warm potatoes with lime juice and place in the double decker taco. Top with 2–3 tablespoons of Carrot Pico de Gallo. Your Double-Decker Potato Taco Recipe is ready to taste.